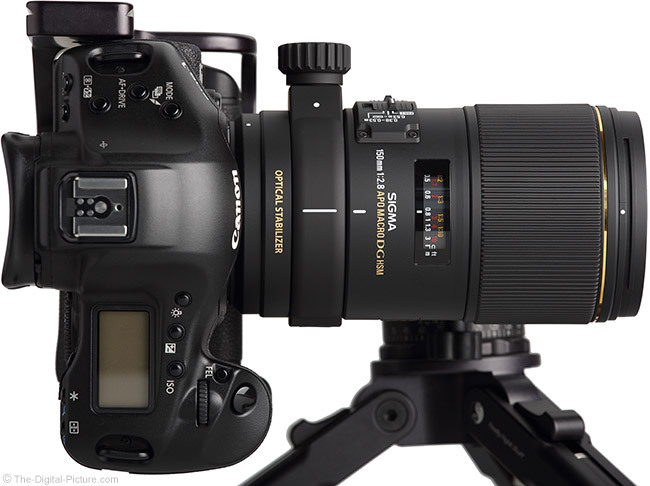 If you are looking for a macro lens that provides great image quality, has optical stabilization, has a modest size and weight and offers a relatively long-for-macro focal length in a nicely designed and well-built package, the Sigma 150mm f/2.8 EX DG OS HSM Macro Lens deserves your consideration. The modest price tag for what you get results in an always-loved good value. Especially unique for this lens is the focal length. If you search for a "150mm macro lens" at your favorite online camera retailer, the Sigma 150mm f/2.8 EX DG OS HSM Macro Lens is the only lens you will find. No other lens manufacturer offers a DSLR macro lens in this focal length and even a prime non-macro 150mm lens is not available from Canon, Nikon, Sony, Tamron, Tokina, Zeiss and many other large lens manufacturers. The 150 OS macro replaces Sigma's first 150mm macro lens, the well-liked 150mm f/2.8 EX DG HSM Macro Lens. The relatively long-for-macro focal length yields a nice amount of working distance and a great background compression. The background of your images is very important, and the 150mm angle of view, compared to the more common 100mm focal length, allows less of the background in your image while creating a stronger blur of that background. While not offering the close perspective of a 50mm or similar focal length, I find myself reaching for longer focal length macro lens most frequently. The 150mm focal length is not the longest commonly offered by lens makers. 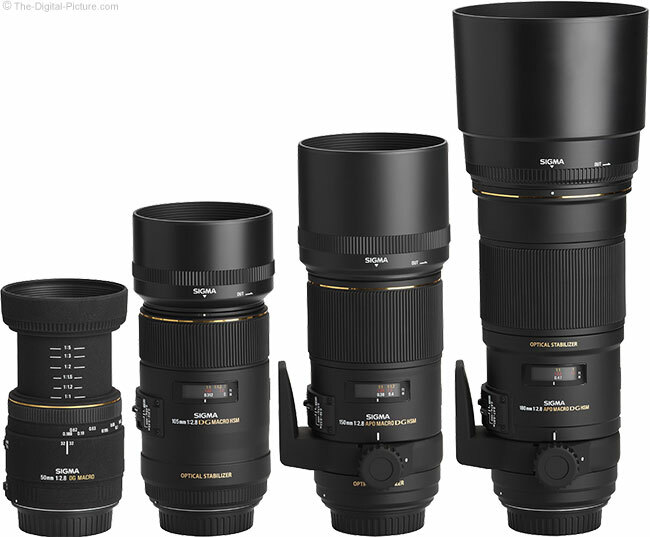 Most manufacturers (including Sigma) have a 180mm macro lens and Nikon's longest macro is 200mm. The downside is that the longer focal length lenses are all larger, most have narrower max apertures and most are significantly more expensive than the Sigma 150 OS. The Sigma 150 OS lens' f/2.8 is equal to or wider than all other greater-than-60mm macro lenses with a 1:1 reproduction ratio. When shooting at a very close distance, the Sigma 150 OS lens' max f/2.8 aperture will not always be considered an advantage unless a very strong blur is the goal of the photo. 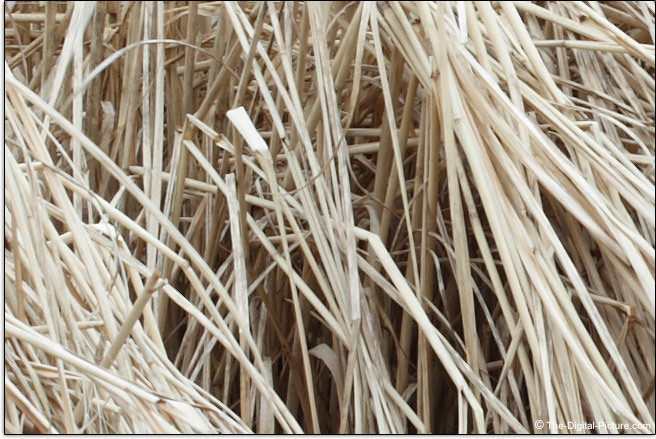 Here is an example of the depth of field delivered by this lens at apertures separated by 1 stop. The imaging sensor was about 16" from the flower-shaped candy when these images were captured, so the reproduction ratio being shown is very close to 1:1/1.00x. As you can see, there is not much of the frame in focus at f/2.8. Note that, as with all macro lenses, the effective aperture becomes narrower as very close macro focus distances come into use. The camera's auto exposure system will automatically compensate for this loss of light, but manual exposure settings will need to be adjusted to compensate for this. Mounting this lens on an ASP-C/1.6x FOVCF sensor format DSLR results in an angle of view equivalent to a 240mm full-frame-mounted lens. The lens does not change of course, but the full image circle is not utilized. The lens remains a 1:1 reproduction ratio (1.00x Maximum magnification) lens, but the subject is going to cover a larger percentage of the sensor, resulting in a more-tightly-cropped image. Nearly all macro lenses are useful for general purpose needs with tightly-framed portraits being one of this lens' strengths. I've used this lens on occasion for landscape photography. The available subjects for a macro lens are extensive and readily available. 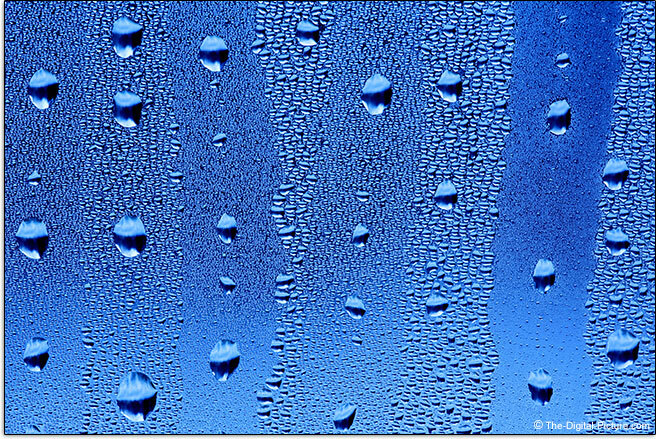 Sometimes they are right in front of your eyes as was this small area of condensation that formed on a kitchen window one very cold morning. The background for the condensation was a monochromatic gray and white winter woods with snow on the ground. Using a creative white balance (2500 K) along with some contrast increase, I was able to give the image a significantly different look. Your macro subject may also be found as close as your kitchen cabinet. 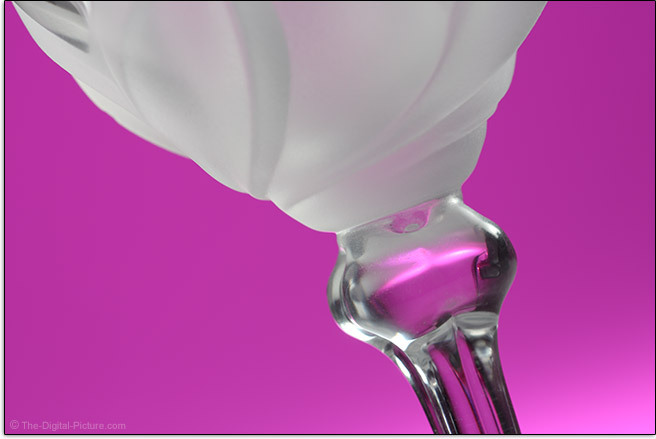 A Rogue Flash Gel attached to a Canon Speedlite 600EX-RT Flash provided a lively background color to the frosted clear glassware. Making handheld macro photography more of a reality and assisting in ideal handheld subject framing is Sigma's Optical Stabilization or "OS". The Sigma 150mm OS Macro lens is Sigma's second macro lens to include OS (the 105mm OS Macro was the first). The two lenses' OS system function very similarly. When OS activates, there is a mild but audible noise and the same noise is heard again when OS turns off. The sound is hard to describe, but let's say that it is a "cuuussshhk". I know, you're thinking "That was fun to say!" Some very light whirring can be heard when OS is active and deeper clunking sounds can sometimes be heard – especially when the lens is moved. The viewfinder remains stable during OS startup and shutdown, but like the 105 OS, the subject framing wonders around slightly. This anomaly is most noticeable when holding the camera in a very stable position. While the amount of movement is small, it is annoying nonetheless. The 150's OS requires a second to activate, but you will know when this has occurred – the viewfinder image will settle and the startup "cuuussshhk" will complete. Full disclosure: the OS unit in my lens failed during the time I've had the lens. I was not seeing a stabilized image in the viewfinder and then OS would not turn off – even if the camera was powered off. The lens had to be removed from the camera to shut down the OS system. Remounting the lens reactivated the same problem. No worries as Sigma USA quickly repaired the lens (5 day repair turnaround) for no charge under warranty. Full disclosure II: The OS system failed a second time during final OS testing. Same problem apparently not fixed properly the first time. This lens has obviously earned another trip to Sigma. Sigma rates this lens for 4 stops of shake reduction. Though Sigma did not confirm for me, the 4 stop rating is probably not applicable at the closest focusing distances this lens is capable of. The Canon EF 100mm f/2.8 L IS USM Macro Lens, with its macro-ready Hybrid IS, is rated for only half of its normal 4-stops of shake reduction when used at 1.00x magnification. My testing shows that I can handhold this lens using shutter speeds as long as 1/20 sec., representing about 3 stops of assistance for me. A high percentage of the results captured at longer exposure times were motion blurred, though the comparison images below were captured at 1/10 second. Note that, like the 105 OS, the 150 OS Lens owner's manual instructs that the OS switch should be in the off position when mounting/dismounting the lens. I make it a rule to not remove a stabilized lens while OS is active. The owner's manual also instructs that OS be turned off when using the lens on a tripod. This is my standard practice with all stabilized lenses (except Canon's big white super telephoto lenses). OS cannot stop an in-motion subject, but the mode 2 setting provides stabilization in one direction only, to allow panning with a subject. While this mode will not likely see much use in macro photography (panning with a line of marching ants? ), it has value for other uses. Macro lenses as a group tend to produce very sharp images and the Sigma 150mm f/2.8 EX DG OS HSM Macro Lens does also. While this is not the sharpest lens at f/2.8, it does not perform terribly at that aperture. Stop down to f/4 and the 150 OS is very sharp across the entire full frame image circle. Only slight improvement is seen at f/5.6, but this lens is razor sharp at this aperture. These results are repeatable and with real world subjects. The f/2.8 to f/4 sharpness change is quite noticeable, but it is especially hard to see the f/5.6 improvement. This lens delivers excellent sharpness and sharpness is not a reason to stop this lens down further. Diffraction is the next effect on sharpness seen by stopping down. While it would be great to report that f/2.8 image quality is equal to what this lens delivers at f/4, realistically, if you are using f/2.8 at macro focusing distances, most of your frame is likely to be blurred due to the razor thin depth of field. Expect to see about 2 stops of vignetting in full frame corners at f/2.8. While noticeable, this is not a strong amount for a fast prime lens. A just-noticeable 1 stop of shading remains at f/4 with negligible amounts at narrower apertures. With under 1 stop of shading in the corners at f/2.8, APS-C format camera owners will not likely notice much vignetting when using this lens. CA (Chromatic Aberration) is very well controlled with only a small amount showing in full frame corners under harsh contrast conditions. As focal lengths increase, so does the likelihood of flare showing in the site's standard sun-in-the-corner-of-the-frame flare testing and the 150 OS indeed shows some flare. The amount is not bad and is in line with the other lenses tested. You can count on the Sigma 150 OS Macro to keep your straight lines straight as this lens has negligible distortion. Macro lenses are often used for copy work – such as copying documents and art work. The lack of distortion makes this lens well-suited to this task. From a bokeh (background blur quality) perspective, this lens appears to be good/normal. With its short minimum focus distance and moderate telephoto focal length, this lens is definitely able to create a lot of bokeh to look at. Driven by Sigma's HSM (Hypersonic Motor) technology, the 150 OS Macro focuses quickly. With only some lightly-audible clicking, this lens also focuses quietly. Focusing is internal and, always helpful for circular polarizer filter use, the front element does not rotate. This lens enables FTM (Full Time Manual) focusing. Focus can be adjusted at any time – before or after AF. A Focus Limiter Switch is provided. Selectable ranges are: 1.25 - 1.74' (0.38 - 0.53m), 1.74' - 8 (0.53m - 8) and the full 1.25' - 8 (0.38m - 8) focus range. Using a restricted focusing range can reduce focus hunting. I do experience occasional focus hunting with this lens, most often in the macro range as that is distance I've most-used this lens. Overall, this lens performs well in the AF department One shot focus accuracy has been good. Depth of field markings are not provided, but magnification ratios are included in the focus distance window. The manual focusing ring is very nicely sized, is smooth and has the right amount of resistance. My lens' MF ring has a very slight amount of play when changing directions. This is annoying when I am focusing on this attribute, but ... it has not bothered me much in real use. The 150° focus ring rotation adjusts focus distance a bit quickly for my liking, especially at longer focus distances. Subjects change size noticeably as they go into and out of focus. Focus distance markings (ft and m) are provided in a focus distance window. That this lens can reproduce subjects at life-size on the imaging sensor is what a true macro lens is all about. Whatever display (or print) you are viewing your images on is likely many times larger than the size of your imaging sensor, which means the subject is rendered at many times larger than life-size (especially if zoomed to 100% pixel level). That this lens can focus close enough for 1:1/1.00x MM (Maximum Magnification) is not unique to macro lenses, but again, it is one very good reason to add such a lens to your kit. When planning to use a lens at or near its MFD a significant amount of time, you need to understand working distance and how it affects your photography. The MFD spec is based on the distance from the subject to the imaging sensor. Although the longer focal length lenses are also physically longer, the longer focal lengths still give you more working space – and make it less likely that you will frighten a timid subject away. You can use this site's specs and measurements information to calculate the actual from-the-end-of-the-lens working distance for any lens in the database. Using the referenced calculation shows that the Sigma 150 OS lens' working distance is about 7.4" (186.1mm) – compared to 5.6" (141.6mm) for the Sigma 105 OS. Install the hood and the minimal working distance goes down to 4.8" (119.5mm) – compared to 3.7" (93.6mm) for the Sigma 105 OS. So, the increase in focal length indeed provides an increase in working distance. That increase appears more significant if looked at in terms of percentage increase instead of the distance difference. To go beyond 1:1/1.00x MM, use one or more extension tubes behind the Sigma 150 OS Macro. As extension tubes have a larger MM effect behind shorter focal length lenses, you will want to use the larger ETs available. Or better yet, use an extender/tele-converter. 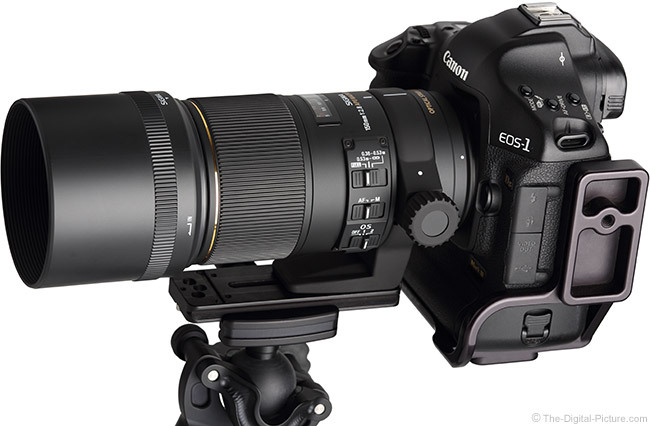 The Sigma 150mm f/2.8 EX DG OS HSM Macro Lens is compatible with Sigma's 1.4x and 2x DG tele-converters. With the 1.4x mounted, this lens becomes a 210mm f/4 OS lens with a 1.40x MM and it becomes a 300mm f/5.6 OS lens with a 2.00x MM when the 2x is behind it. The biggest downside to using extenders is that they negatively impact image quality. I suggest stopping the aperture of this lens down at least one stop to get decent results when using extenders. Image quality at 210mm f/8 is quite nice, but f/11 looks best at 300mm. Note that this lens will focus between 1.25 - 1.74' (0.38 - 0.53m) only in manual focusing mode when tele-converters are attached. The Sigma 150mm f/2.8 EX DG OS HSM Macro Lens is one of the last lenses introduced prior to Sigma's Global Vision line being announced. 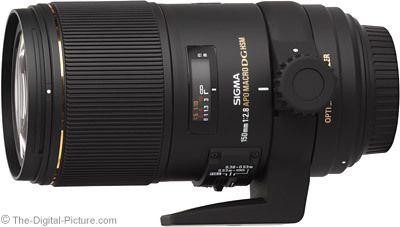 While the new GV lenses are very nice, the lens design Sigma was using just before GV is also nice. This lens has an attractive matte black finish and a smooth overall design. The button panel is raised a modest amount and raised even more by the OS switch. Because of the lens design, my hand seldom contacts the raised panel or the switches – especially with the tripod ring in place. 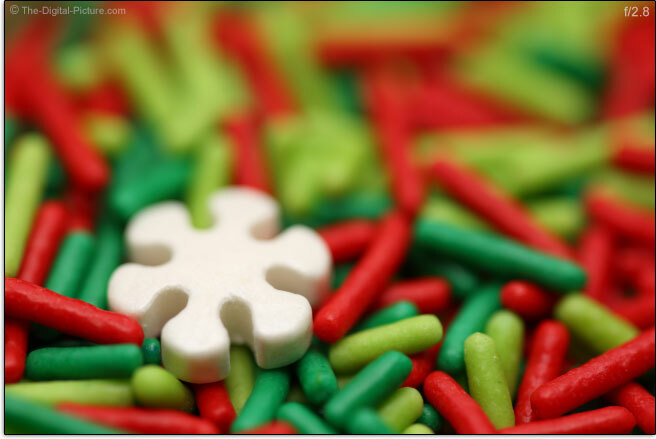 As I said before, there is a little play in the focus ring. Ten or twenty years ago, this amount of play would have been considered excellent. Today, I believe there could be none. There is also some play in the OS mode switch. I would like this switch, especially since it is a 3-position variety, to click more firmly into a locked position. The 3-position focus range limit switch does this. Included in the 150 OS box is a tripod ring, allowing you to ideally balance the camera and lens on a tripod and allowing the lens to be freely rotated as desired (no need to use a ball head drop notch). Tripod rings are especially great for tripod-based macro work and great for mounting other attachments to (including flash brackets). The 150's tripod ring is quite smooth and is removable even while mounted to the camera thanks to a smooth, flush hinge. The lock knob is a short-rotation design, going from locked tight to fully unlocked in about 45°. You may decide to remove this ring when it is not actively being used (such as when shooting handheld) due to the tripod ring lock knob and foot interfering with the photographer's right hand when either is rotated into the grip area. Since the lock knob is oriented 90° from the foot, it is not easy to rotate the foot to a completely out-of-the-way position. You can of course leave the ring in the normal position and utilize the foot as part of your grip method. Many of the images in this review show a Wimberley P30 Lens Plate mounted to the foot. The P30 is longer than needed, but it makes a great macro slider to use for fine-tuning focus distance in a compatible tripod head clamp. Since the 150 OS' foot has a single threaded insert (this is normal), a lens plate with anti-rotation nubs should be used to prevent the plate from twisting. The P30 is currently Wimberley's longest anti-twist plate. The 150 OS utilizes a 72mm filter size. Nice is that these are not the largest, most expensive filters available and also nice is that many other lenses share this same thread diameter. Use a step-up adapter ring if you already have larger-sized filters (note that the lens hood may not mount of the step-up ring). I appreciate that Sigma includes a lens hood with most of their lenses. I highly recommend using lens hoods and, being modestly long, the 150 OS lens' hood is especially protective from both bright light and from impact. That this lens hood is narrow means that it stored very compactly when attached in reverse orientation. The Sigma 150 OS Macro comes with a nice zippered, padded nylon case. However, the case is quite large. The APS-C lens hood extension does not reverse on the lens, which means that that case must account for the longer length. There is a large cushion on the bottom of the case to fill the void and afford proper lens protection without the APS-C extension attached. The Sigma 150mm f/2.8 EX DG OS HSM Macro Lens is a medium-sized lens that remains easy to carry and use. The difference in size between this lens and the 180mm+ lenses is greater than the weight difference with the heavy Sigma 180mm OS Macro Lens being an exception. 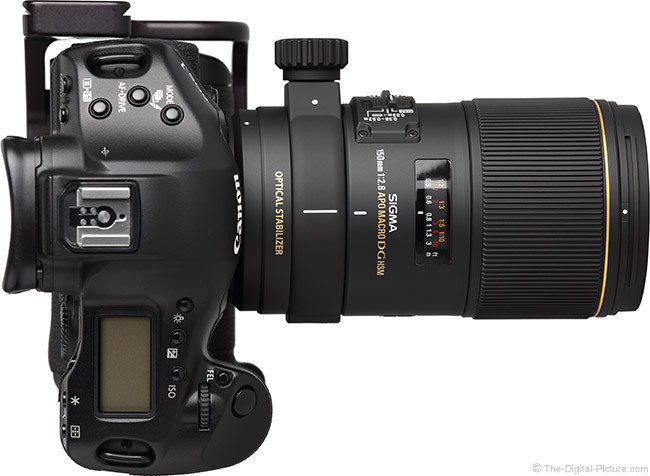 For many more comparisons, review the complete Sigma 150mm f/2.8 EX DG OS HSM Macro Lens Specifications using the site's Lens Spec tool. The Sigma 150mm f/2.8 EX DG OS HSM Macro Lens is priced more like a 100mm macro lens than the bigger 180mm lenses that wear also-bigger numbers on their price tags. While the Sigma 105 OS has a strong rebate available at review time, the 150 is not much more expensive than the 105's regular price. Macro lenses are a lot of fun to use and to see/share the results from. I highly recommend that every kit contain at least one of these lenses. 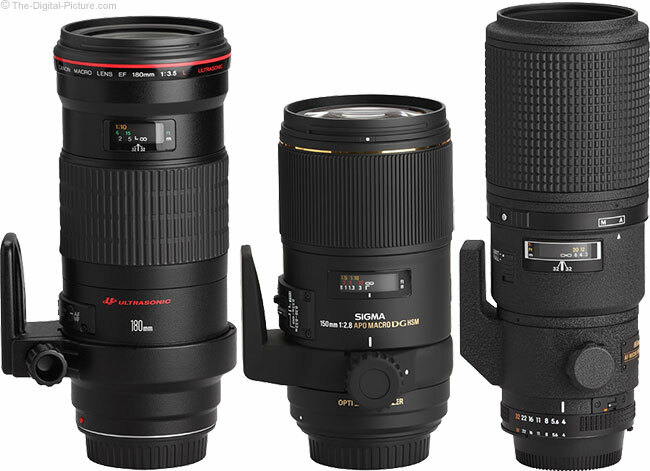 There are a lot of macro lenses to choose from and many deliver excellent image quality. I maintain a list of recommended Canon macro lenses and Nikon of course has their strong contenders. 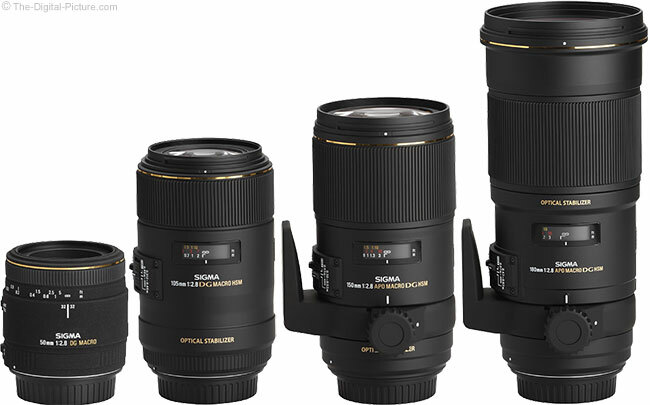 Here is a look at the current-at-review-time Sigma macro lens lineup. While the 150mm lens is notably heavier than the 105mm option, the 150 is not much larger than the 105. 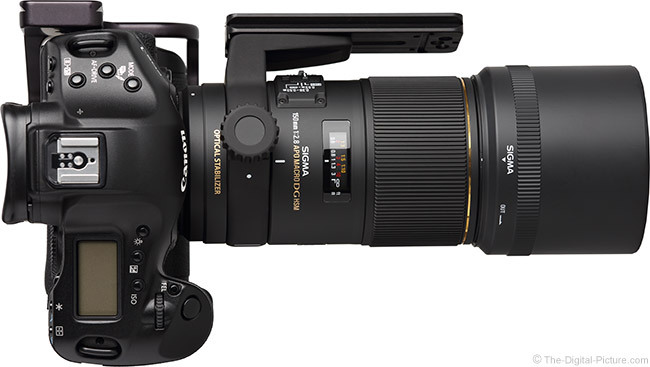 The Sigma 180mm f/2.8 EX DG OS HSM Macro Lens is the 150 OS lens' big brother, and the bigger lens will put a noticeably bigger dent in your wallet. The 180 f/2.8 is a larger, heavier lens with a wide f/2.8 aperture and image quality equal to or better than the 150 (especially better at f/2.8). The 180mm focal lengths will provide a narrower angle of view that also delivers a stronger background blur (and less background to is included to concern about). The 180mm lenses also provide more working distance. The Sigma 180 OS lens' MFD working distance is about 8.8" (221.6mm) compared to 7.4" (186.1mm) for the Sigma 150 OS and 5.6" (141.6mm) for the Sigma 105 OS. Install the hood and the 180's MFD working distance goes down to 5.91" (131.0mm) – compared to 4.8" (119.5mm) for the Sigma 150 OS and 3.7" (93.6mm) for the Sigma 105 OS. I have not yet fully evaluated the Sigma 180 OS Macro Lens, but it looks great in the lab. 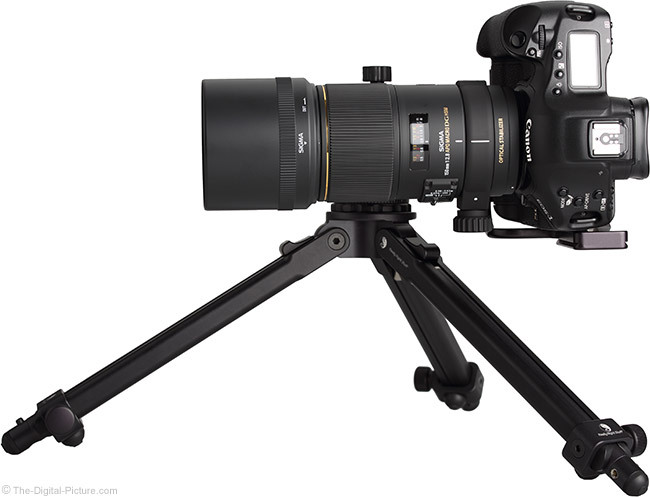 Here is the Sigma 150 OS between Canon and Nikon's long macro lenses. 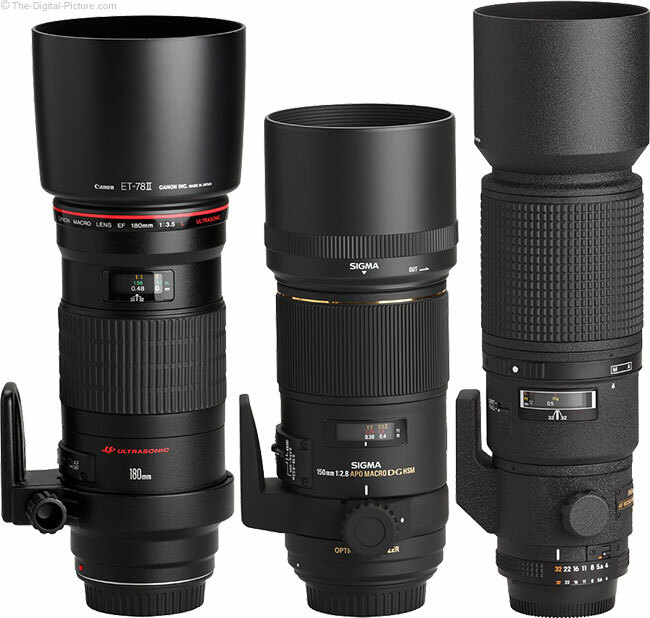 The Canon weighs less than the Sigma 150 and the Nikon is very slightly heavier. 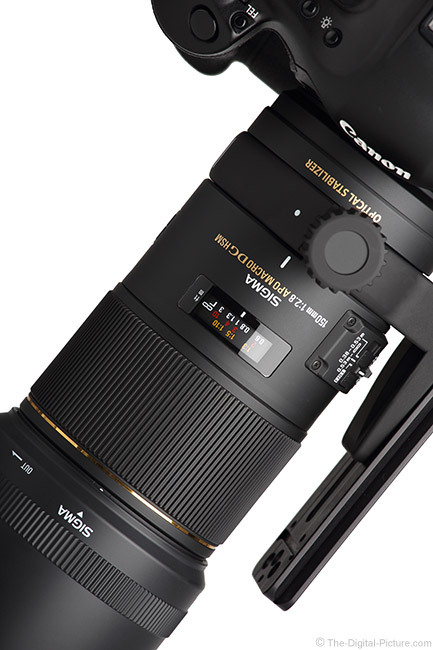 The Canon EF 180mm f/3.5 L USM Macro Lens has long been one of my favorite macro lenses. From an image quality perspective, these two lenses are similar at the same aperture settings. The Sigma has a 2/3-stop wider aperture, has OS and is less expensive. The long Nikon "micro" lens has a 200mm focal length, but it has an MFD spec nearly the same as the Canon 180 L, so the difference in focal length at MFD is very small and not very relevant in comparison. The Nikon appears old in design, but it has image quality on par with the rest of these high-performing lenses. The Sigma has a 1-stop wider aperture, has OS and is less expensive. Excluded from the comparison images is the Tamron 180mm f/3.5 Di Macro Lens (excluded because I still need to shoot the product images for this lens). The Tamron lens has a big price advantage, but does not match the Sigma 150 OS lens' image quality until about f/11. The Sigma has a 2/3-stop wider aperture and has OS. If you are only using narrower apertures (f/8 and narrower), the Tamron may be a good deal for you. 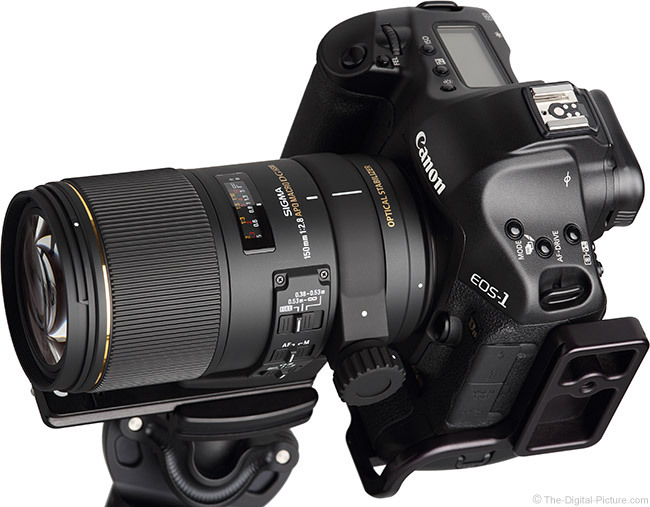 The Sigma 150mm f/2.8 EX DG OS HSM Macro Lens is available in Canon (reviewed), Nikon, Sony/Minolta and Sigma mounts. My standard disclaimer: There are potential issues with third party lenses. Since Sigma reverse engineers (vs. licenses) manufacturer AF algorithms, there is always the possibility that a DSLR body might not support a (likely older) third party lens. Sometimes a lens can be made compatible by the manufacturer, sometimes it cannot be made compatible. There is also the risk of a problem that results in the lens and body manufacturers directing blame at each other. Sigma USA's 3-year warranty is superior to Canon's standard 1 year warranty (Sigma's North and South America warranty is also 1 year). My experience, unfortunately, is that I have needed service for the 150 OS twice and, though no lens is immune from a failure, I have never sent a Canon macro lens for service. The evaluated Sigma 150 OS was purchased at online at regular price. Sometimes a lens is remarkable for what doesn't jump out at you – or get in your way. I have been using this lens intermittently for just under two years. It has reliably delivered excellent images for me. And that is what I expect from a good lens – one that I pick to use because of its attributes, not because I happen to be reviewing it. I have not kept-secret my love for macro lenses and the fun that can be had with them. Aside from the OS failure issue, this lens ranks right up with some of my other favorites. The Sigma 150mm f/2.8 EX DG OS HSM Macro Lens is the great-value of long focal length macro lenses.